B.C. 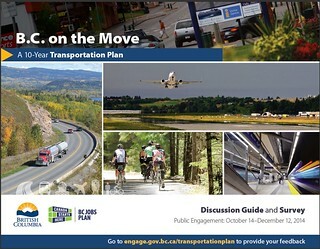 on the Move is the Government of B.C.’s new 10-year plan for the improvement of the province’s transportation network. The plan was developed by government with input gathered during an extensive engagement process in fall 2014. The engagement included a public survey that drew over 12,500 responses from throughout B.C. Concurrently, ministry staff held over 100 meetings throughout the province with First Nations, local governments, transportation authorities and other interested stakeholders to gather information on local and regional priorities. In addition, MLA Jordan Sturdy, Parliamentary Secretary to the Minister of Transportation and Infrastructure, met with over 70 groups on Vancouver Island in Sept. 2014 to hear about the transportation needs of Island communities. The actions prioritized in B.C. on the Move will grow the economy, improve safety, maintain and replace aging infrastructure and support trade for B.C.’s expanding resource sectors through Canada’s Asia-Pacific Gateway. B.C. on the Move sets out a series of transportation priorities, reinforced by a $2.5-billion commitment from the provincial government over its first three years. The final plan and appendices are posted on the right hand side of this page. You can take the survey to share your thoughts about transportation priorities between October 14, 2014 and December 12, 2014 at 4 pm. Information about the provincial and regional transportation network to help you participate in the process. An opportunity to share your thoughts on transportation priorities and issues that matter most to you and your community through a survey. Concurrently, the Ministry of Transportation and Infrastructure will meet with key stakeholders, including First Nations, local governments, port and airport authorities and other community leaders, to talk about transportation issues that are important to them. Discussions will focus on opportunities for improvements to the transportation network that can help build healthy, sustainable communities and support jobs and families in a growing provincial economy. Input gathered from this public engagement and from stakeholder meetings will be considered as government develops the new 10-year plan. The plan will be posted in early 2015, and will set out a series of short, medium and longer-term priorities for government.